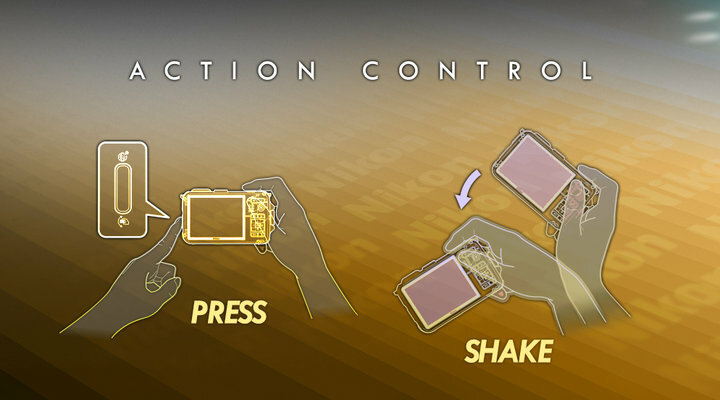 Action Control is a mode incorporated into select Nikon cameras such as the COOLPIX AW100 and COOLPIX AW110. When the camera's action control is set to ON, you can control certain functions of the camera simply by swinging it in the air. The default setting is HIGH, which means that even if the camera is shaken by a small amount, it will register. When set to LOW, a large amount of movement is needed to register by the camera. When wearing gloves, it’s not always so easy to access the various buttons on a camera—but the camera's Action Control makes it simple. The action button, (on the side of the camera) sets the camera to perform certain shooting/playback functions or display the current location on a map during playback. Then shake the camera in a single up/down or forward/backward motion to perform the selected function. Swing camera in the air to control settings.